While most of my recipe posts on Cultural Chromatics are sweet, in ‘real life, I make a lot of savory foods. My signature dish is roast chicken– it’s always a favorite in the household. And for breakfast most morning, it’s eggs. In my former life, I had worked in medical weight loss, which changed my eating habits permanently. Ironically, I had worked there for about a year before I tried going on their diet, which I did for a month. As an office manager, it wasn’t imperative for me to actually have tried the diet, but I felt that by trying it, I could build better relationships with the patients that came in, which ultimately made my job easier. The diet is kind of like a restricted paleo diet, where you could only eat about 1200 calories or so. Not only did I effectively lose about 8 pounds in a month, it changed the way I eat forever. In a good way– I eat less sweets and crave more whole, healthy foods. But obviously, I still love me some delicious dessert. Before I went off on my tangent, I had mentioned eggs. I love eggs in almost any form– they’re quick, easy, delicious, and oh so versatile! I usually eat them for breakfast every morning– but real talk: even I can get tired of eating eggs over and over again. 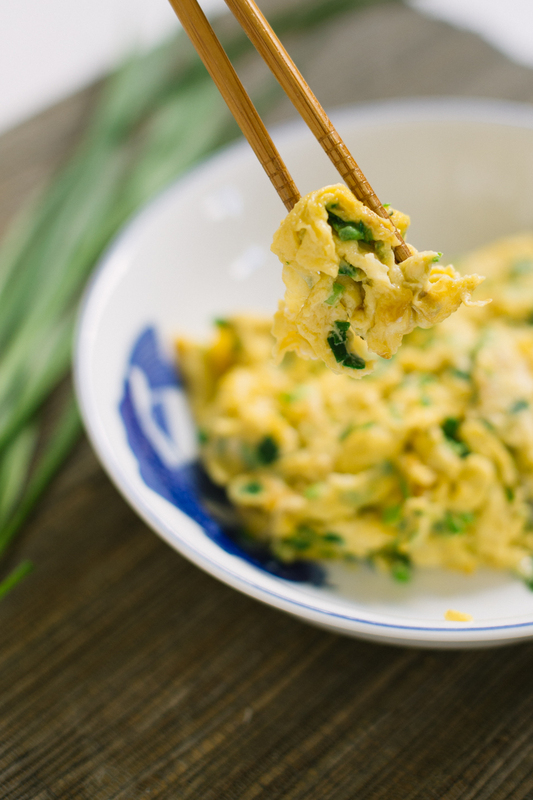 I had an excess of chives this weekend, so I was inspired to make a popular Chinese dish, scrambled eggs with Chinese chives. 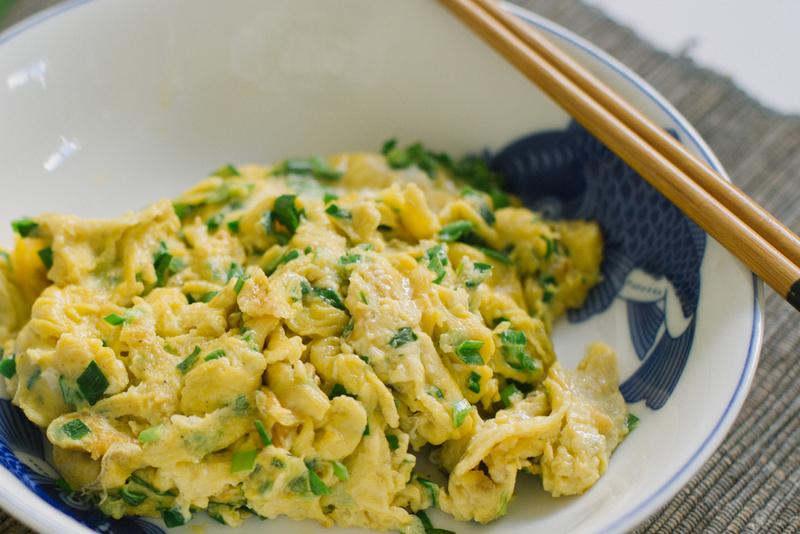 This is a common dish in Asian cafes, and the chives add a lot of flavor in a healthy way. Enjoy! Beat the eggs with oyster sauce, cooking wine, and a dash of white pepper. Add a drop of cooking oil– about 1/8 tsp worth. This is so that the eggs achieves that fluffy, restaurant style texture. Beat with a fork and then add the chives. Over medium heat, oil a medium-sized saute pan. Using a heat-resistant rubber spatula or wooden spoon, gently push one edge of the egg towards the center, then do to the opposite side. Keep doing this, and flipping if necessary to cook the egg to your desired doneness.